School is out and we are raring to go for a summer of fun around here! First order of business? 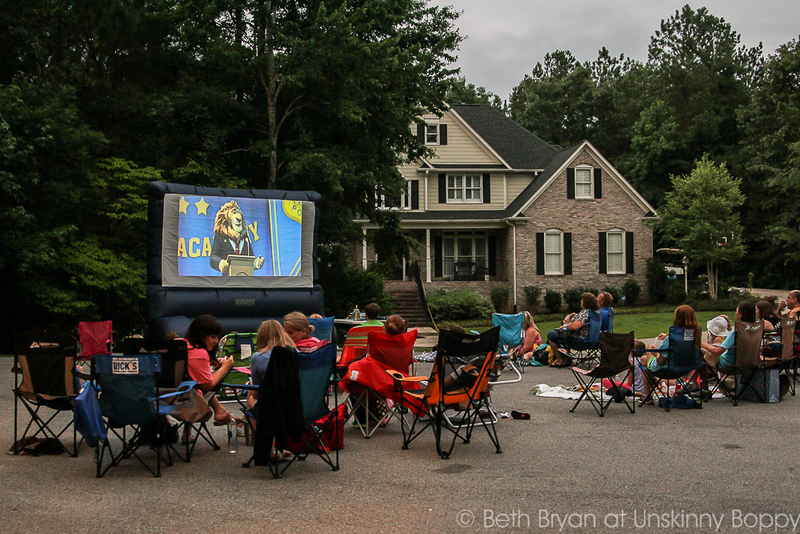 Hosting an outdoor movie night for the neighborhood! When we moved into this new house, I volunteered to be the Special Events Coordinator for the entire neighborhood (I know, I know…I couldn’t help myself). 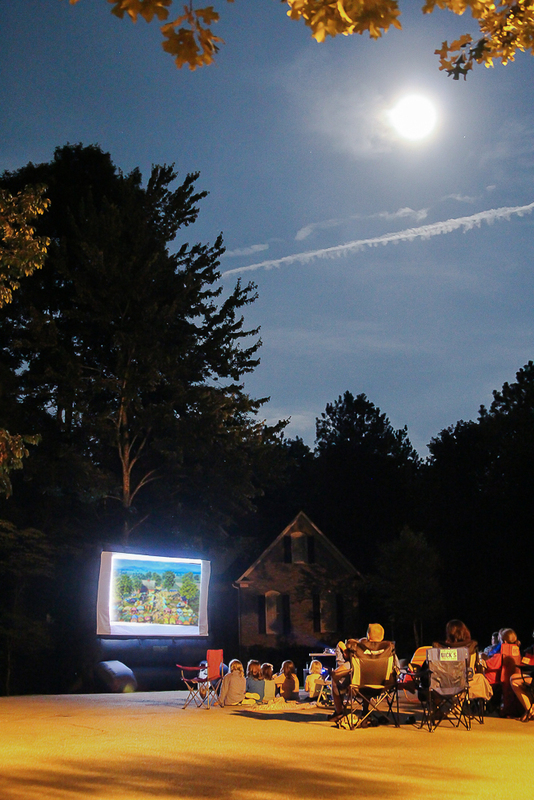 One of the summertime bucket list things I’ve always wanted to do is host an summer movie night. I intended to do it last summer but I was like 40 months pregnant and it was just way easier to park my big belly over an air vent and stay indoors during the heat. But not this year, baby! Last night we made this event happen. 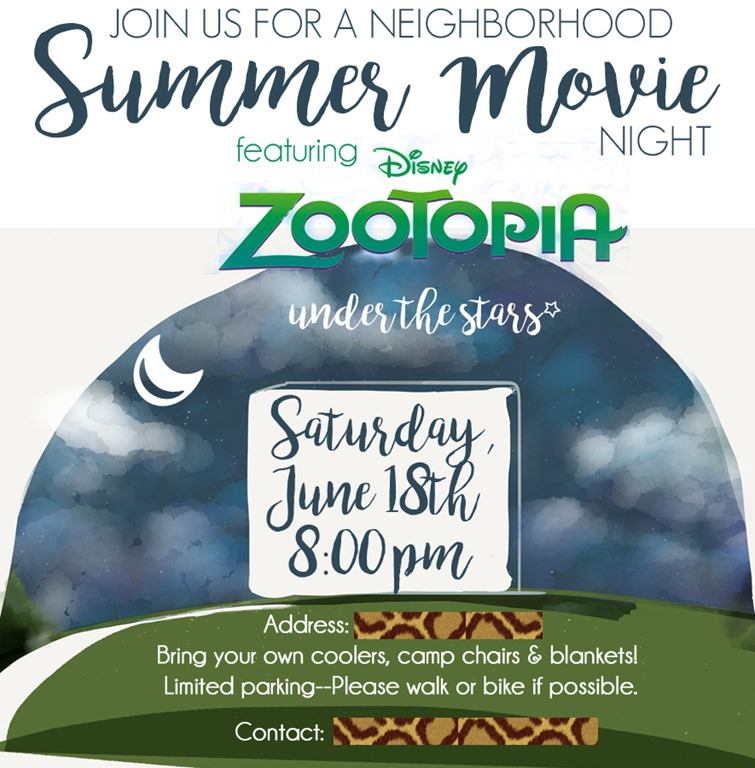 We had about 40 people spread out on blankets, camping chairs and golf carts around our cul-de-sac watching Zootopia under the stars. The evening started out cloudy but it cleared up and the weather was perfect. We even had a full moon show up! ~ 12’ inflatable movie screen from Amazon that worked perfectly. It blows continuous air to stay inflated so take that into account when planning for electricity. ~Heavy Duty 100′ extension cord with a surge strip to handle all the electronic outlets. 100′ was plenty of length for us to get from our front porch to the street. We also had another smaller extension cord for the inflatable screen. Bear in mind you need a plug running one direction for the inflatable screen and three more running the opposite direction for the projector/speaker/dvd player sitting on a card table about 15-20 feet away. ~Sony VPL-CX5 projector. We got lots of comments on how bright this projector was, even at dusk before it got really dark outside. It was perfect for this event. This projector has done lots of work for us over the years- starting with our wedding reception slideshow 11 years ago! I can highly recommend it. ~DVD player to hook up the movie to the projector. Any DVD player will work. We like our LG one. Make sure you have a DVD player with a regular RCA cord to connect the visuals. ~Some kind of speaker system- we have a big karaoke machine that is so loud you could broadcast to the whole neighborhood. We had plenty of volume. ~RCA to Headphone jack wire to hook up the speaker to the DVD player. ~Mini-movies to have playing as a “trailer” as folks arrive. I bought a few cartoon collections from the cheap Walmart bins. Minions, Looney Tunes, etc work fine. ~The main movie! Zootopia just came out a few days ago and it was a huge hit with kids and adults both. And that’s pretty much it! 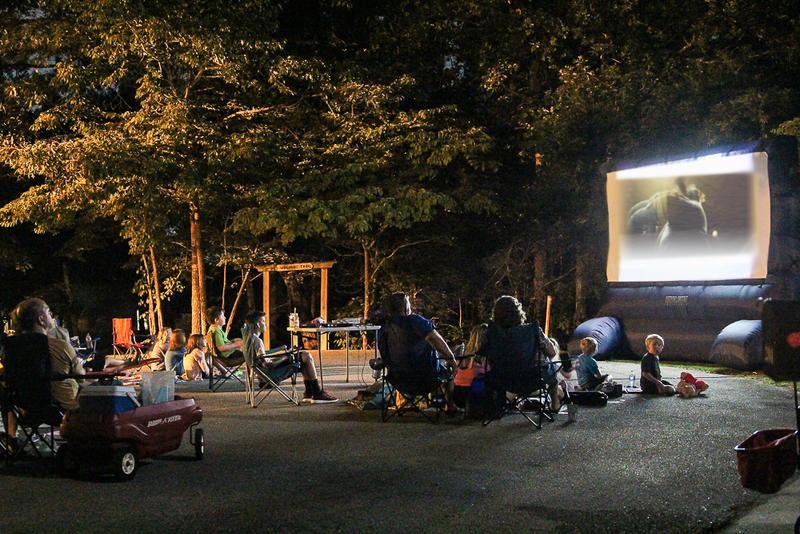 This event was so easy to setup that we are already planning more outdoor movie nights this summer and maybe into the Fall (Halloween would be perfect!) Next time I plan to call our local shaved ice/ ice cream truck and see if they can stop by to sell treats before the movie starts. Otherwise, everyone brought their own coolers and popcorn so there was no work involved there. 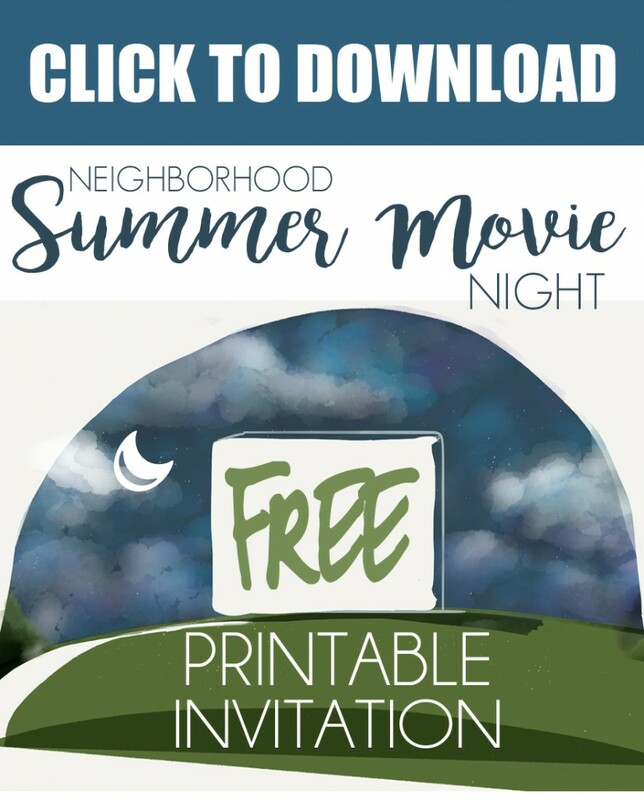 Since I already created this invitation for our neighborhood movie night I thought I would share it with you guys as a free printable in case you wanted to plan one of these for your neighbors, too! I created the background myself using the Paper 53 app on my iPad (Seriously in love with this app!) then I added the text and movie logo in Photoshop. You can download the free printable invite here and add your own address/contact information using picmonkey.com or your favorite smart phone app. 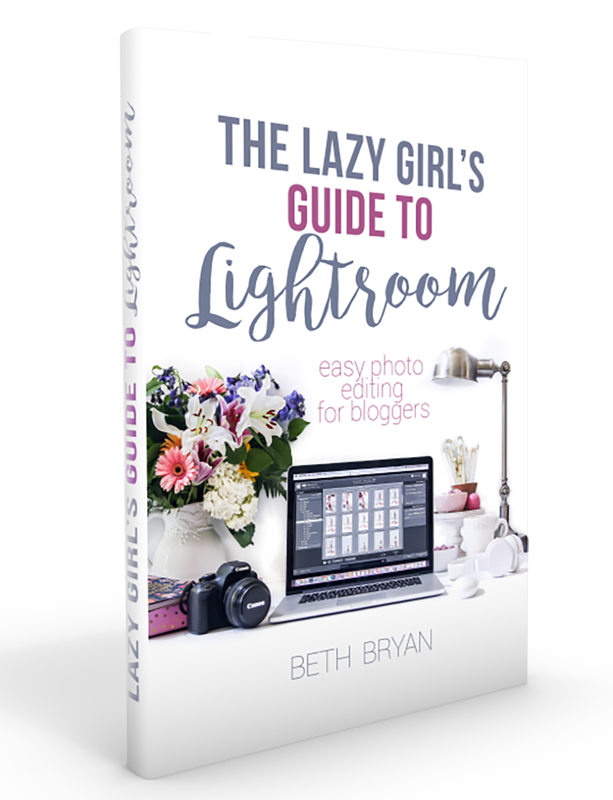 Don’t forget to Pin this image to save this idea for later! Thanks for sharing! We have a smaller house and a sloped yard, so I have been wanting to do this for the ‘hood.